Vault of Midnight Detroit is excited to present the debut issue of an all-new MILES MORALES series, launching in December from Marvel. Written by Detroit-area author Saladin Ahmed (Marvel’s Black Bolt and Exiles, BOOM! Studios’ Abbott) and illustrated by Javier Garrón (Marvel’s Ant-Man and the Wasp), the series centers on a teenage Miles Morales learning to navigate his super-powered responsibilities alongside his personal ones. Ahmed and Garrón will present Miles as a regular teen and street-level hero. But things won't stay quiet in his Brooklyn neighborhood for long -- a bunch of mysterious criminals, including Rhino, start showing up to cause a ruckus, meaning Miles will have to suit up to defend his city. This caps off a career year for local writer, Saladin Ahmed, after winning an Eisner Award [Best New Series] for Black Bolt, receiving industry-wide praise for Abbott, and reviving fan-favorites Quicksilver and Exiles. 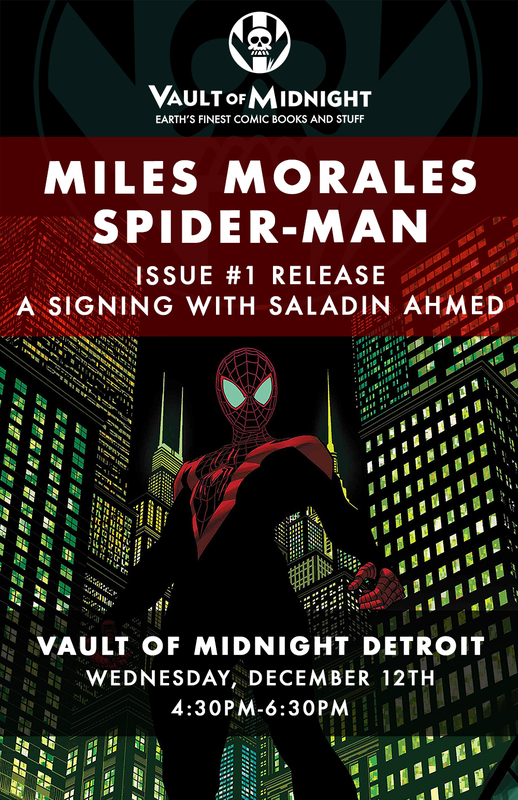 Come celebrate this exciting book launch for MILES MORALES: SPIDER-MAN #1 by meeting Hugo-award winning writer, Saladin Ahmed, for a very special event at our Downtown Detroit location!